1/3-1/2 cup walnuts, chopped up so the largest bits are about 1/2- to whole-peppercorn size, max. most of a 1/4 tsp measure of each: cardamom and ground powdered/dried ginger. These are SO GOOD with butter and honey on them. Great on their own, too; the spices are barely-there, which is good; you could add more if you want, but I think they’ll be a bit obtrusive if you push it. I came across a few recipes that added a little bit of sugar to the boiling water, so I tried that. The sugar perhaps helps give the bagels a bit more of that slightly-shiny, crusty outside, but the effect wasn’t extremely noticeable. I was thinking the extra ingredients would require me to add more water than the 1 1/4 cup I used last time, but I think because the apple and cranberry both carry some moisture (the nuts do, too), it actually requires LESS. I threw in the whole 1 1/2 cup of warm water, and it was way too much. I had to add in almost a half cup of flour, plus maybe 1/2 tsp of vegetable oil to get things back to a relatively-ok consistency. 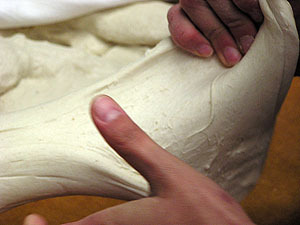 My issues with the dough this time around reminded me that if you don’t know what good bagel dough is SUPPOSED to look like, getting it right can be a little tricky if you’re used to making other breadlike things that tend to be spongier. 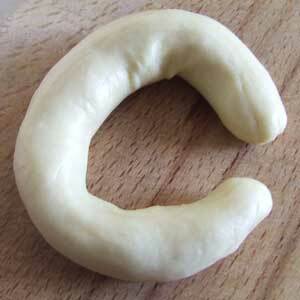 My instinct is always to make the bagel dough too wet. RESIST. 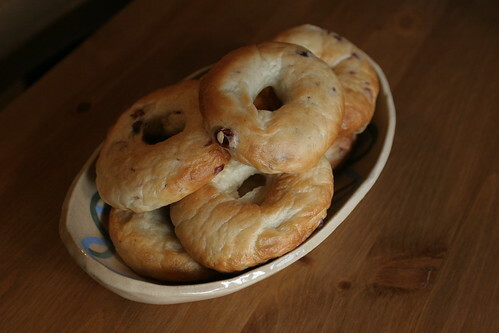 * The photo at the top is of someone else’s cranberry-only homemade bagels, but they look pretty close to mine (mine were a little pinker because of the bit of spices and because the walnuts darkened the flour a bit). Mine got eaten up too fast for me to photograph. ** I peel it with a knife and eat the peel because it’s good for me, and because my landlord stopped letting us put greenwaste in his garden.